Why is that so important? First, it matters because we love God and we love people and we want to see them live in fellowship with Him and with us. Second, what one person does affects the whole. Sin in the lives of our church members can’t be seen as merely a personal issue if we want a holy church. How does a lack of holy living in individuals affect the whole Body? 1) Could dim our light in the world. God asks us to let our light shine so others would see our good works and glorify Him (Matt. 5:14-16). When we all shine for Jesus, the intensity and reach of the light increases. Even one person not letting their light shine, will take away from the brightness. 2) Could be used by outsiders to define the whole church. 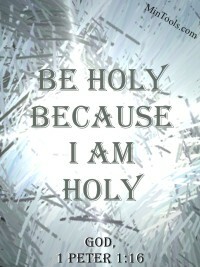 God defines the Church as “a holy priesthood” (1 Pet. 2:5), “a chosen people, a royal priesthood, a holy nation, God’s special possession” (2 Pet. 2;9). This is a people set apart to represent Him to the world. The individual engaged in sin out in the workplace, the neighbor participating in unholy living, the family member living in sin, are what people in the world see and use to define what difference it makes to be a Christian, to be part of the Church. 3) Could bring God’s judgment on the whole church. Think of the Old Testament account of Achan (Joshua 7). One man’s sin, left unchecked, caused the Israelites trouble on the battle front. What spiritual battles might the Church be losing because of “sin in the camp”?